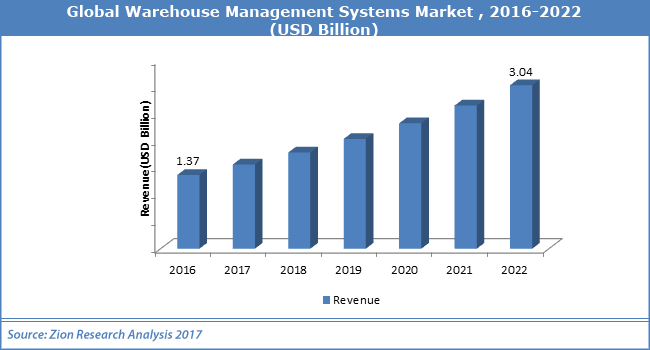 Key companies in warehouse management systems market are SmartTurn, Produmex, Indigo Software, Justransform, SNS, Swisslog WMS, EXE Technologies, Provia Software, Royal 4 Systems’ Warehouse Information System, Infor/SSA Global, Synergy Ltd., Snapfulfil, Yobel SCM, ERCIM, GCM Business Consulting & Technology, and NUO Consulting among others. These players are having a major role in the development of global warehouse management systems market. As per Zion Market Research’s analysts, global warehouse management systems market was capitalized at almost USD 1.37 Billion in 2016 and is likely to cross almost USD 3.04 Billion by 2022, developing at a CAGR of slightly more than 14% from 2017 to 2022. As per analysts at Zion Market Research, rising awareness about the cloud-supported warehouse management system is powering the development of warehouse management systems market. Warehouse management system enables companies to cut manpower costs since the system itself can perform a number of things simultaneously, thereby boosting the warehouse management systems market. With a small base of employees, many things can be performed. On the other hand, costly implementation of warehouse management system solutions and the dominance of ERP merchants are limiting the development of warehouse management systems market. Challenges related with the deployment of the distribution software such as lack of awareness regarding enhanced solutions for warehouse management system, traditional distribution process, and other factors including materials handling interface needs lead to operational disruption risks and resource monopolization. This hampers the development of warehouse management systems market. Many such companies rely on a conventional technique such as paper-based warehouse operations and memory-based processes. These factors are limiting the development of warehouse management systems market. Nevertheless, technological enhancements are likely to lower these hurdles over the years to come. In addition, many mergers and acquirements performed by market players are also predicted to boost the development of warehouse management systems market. For instance, in June 2018, 3PL Central announced its incorporation with TMW Systems. This will bring together a sector-leading portfolio of productivity equipments to enhance abilities for users throughout the supply chain. TMW Systems is a leading supplier of business intelligence, software, and associated solutions in the transportation industry of North America. 3PL Central is the leading cloud-supported WMS (Warehouse Manager System) supplier. Based on component, warehouse management systems market is divided into services and software. Software employed in warehouse management systems market is bifurcated as cloud and on-premise. Services comprised in warehouse management systems market are consulting, system integration, maintenance, and operation. Applications of warehouse management systems market are food and beverage, retail, agriculture, pharmaceutical, and others.